Coincidentally in time for the Major League Baseball All Star break, my new San Francisco Giants shirt arrived. I'm not quite sure what baseball and fish have in common, but Kuma Bear thinks it is a fine shirt. 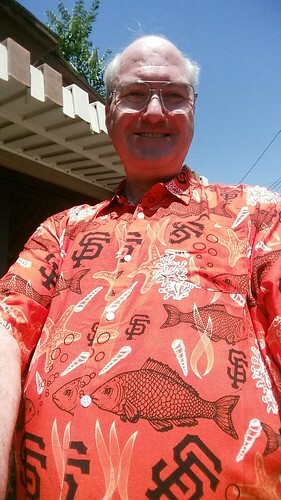 Unfortunately, the floral SF Giants swim trunks that go with this shirt were a little small, but there's another goal to look forward to should I lose some more weight.